One of the great things about Atlanta is that you get the best of both worlds: big-city amenities and opportunities for outdoor adventure. You can spend the day rock climbing and in the evening enjoying fine dining or simple, terrific southern cuisine. Want to experience a perfect outdoor weekend around Atlanta? Here are a few ideas to get your trip started. 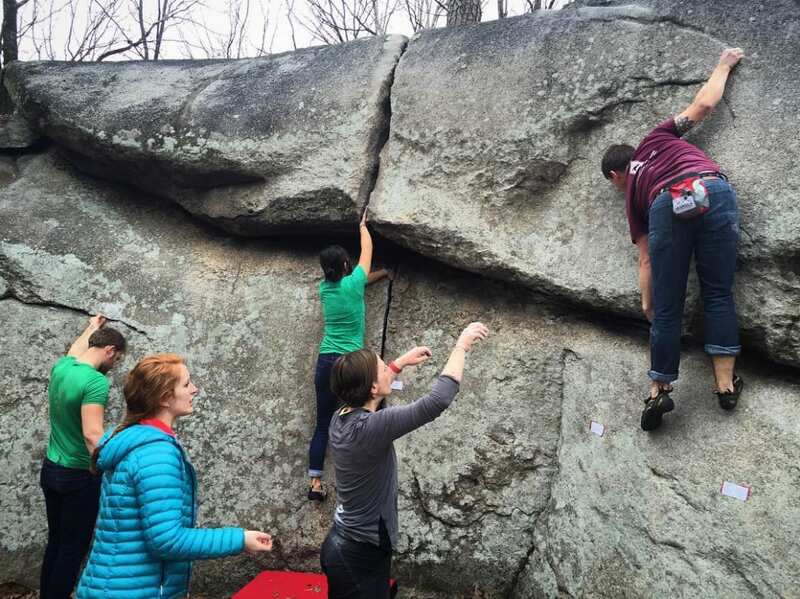 Atlanta’s outdoor climbing scene began to truly develop at the granite boulders of Boat Rock in the 1980s. The area was nearly demolished before the Southeastern Climbing Coalition bought 7.8 acres, thereby protecting the city’s bouldering paradise. Boat Rock’s boulders are featured-laden, making them ideal for setting up a variety of problems. Routes range from V0 to V7, with many V3 and V4 routes. It is one of the few outdoor bouldering spots where routes are marked with signs for easy identification. Another climbing option is to stay indoors and head toStone Summit. The Atlanta location offers more than 30,000 square feet of climbing space, making it one of the largest indoor climbing gyms in the country. There are about 350 bouldering and climbing routes ranging from V0 to V15 and 5.5 to 5.13. Top rope and lead climbing routes can be anywhere from 25 to 60 feet. The gym’s newest location is even larger. Stone Summit Kennesaw, at 31,102 square feet, is a dream for bouldering. A widespread bouldering area flows seamlessly into the main gym to make up one massive climbing area. The bouldering walls are angled to offer more technical lines and some are high, reaching 18 feet (with 1.5 feet of floor padding below). Once you’re off the rocks (or the plastic), give your body a break and fuel up at thriving Atlanta’s coffee scene. Two perfect examples are Octane Coffee and the Dancing Goats Coffee Bar. Octane’s locations on the Westside and in Grant Park offer local art and a chill, hipster vibe. Dancing Goats is supplied by Batdorf and Bronson Coffee Roasters, which has a production facility in Atlanta. Their specialty single-origin coffees are always changing and feature beans from South and Central America and Africa. Dancing Goats two coffee bars include an outdoor patio adjacent to Ponce City Market, which is perfect for al fresco meetings. Counter service restaurants are ideal for quick bites or grab and go. Souper Jenny is king (or queen?) of an Atlanta lunch empire. With locations in Decatur, Buckhead, and Brookhaven, the cafe serves up a rotating menu of hot and cold soups, inventive salads, and a few panini sandwiches. 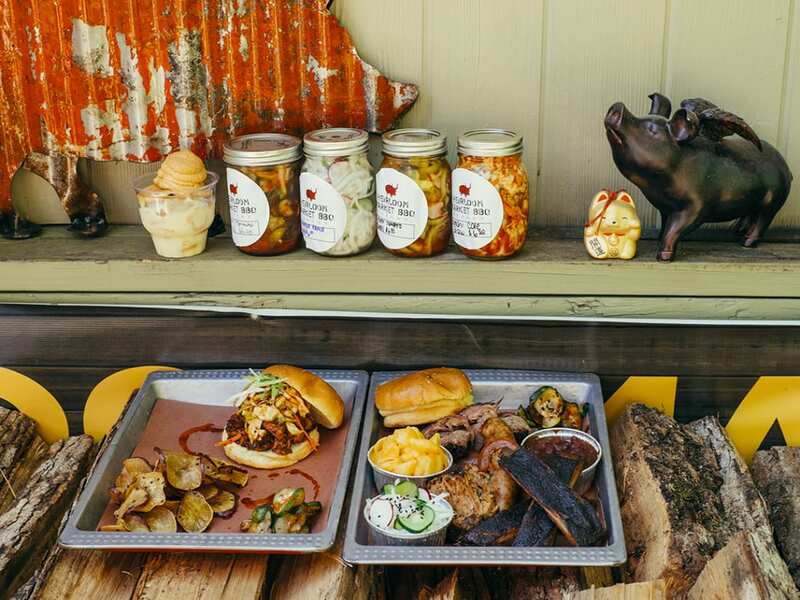 Near the Chattahoochee River, Heirloom Market BBQ’s facade looks like a roadside shack, but the barbecue is a chef-driven fusion of Korean and Texas flavors. There is no indoor seating, only outdoor picnic tables, which is perfect for BBQ-style noshing. Despite being one of the largest cities in the country, Atlanta is in close proximity to superb hiking trails. The city is near two large swaths of land owned by the National Parks Service: the Chattahoochee River National Recreation Area and Kennesaw Mountain National Battlefield Park . 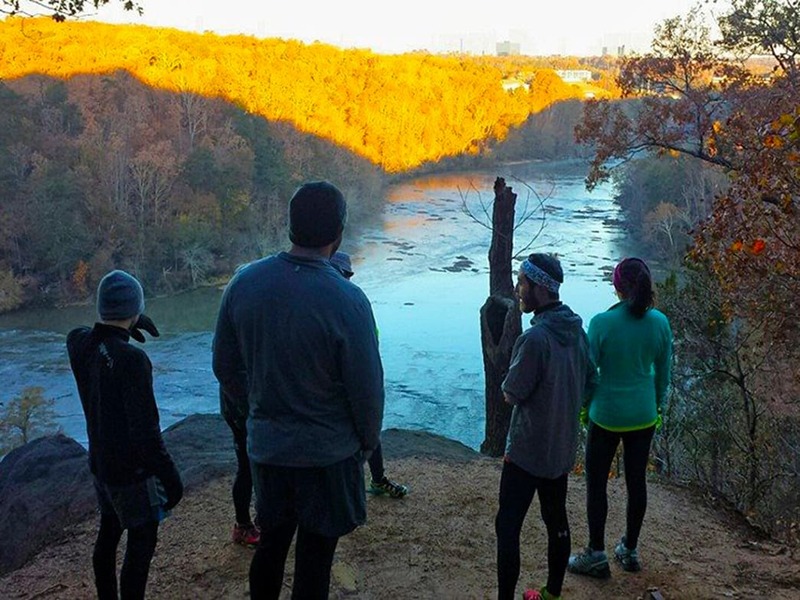 One of the more scenic trails along the Chattahoochee River is East Palisades Trail, where hikers can explore a six-mile loop that highlights rocky outcrops, a bamboo forest, and short, steep climbs. These lead to overlooks of the Devil’s Race Course and Long Island shoals, a few of the class II rapids on the Chattahoochee. Just 30 minutes north of Atlanta, Kennesaw Mountain has enough elevation and distance—more than 16 miles—to warrant a good day hike. The mile-long hike to Kennesaw tops out at 1,808 feet and on clear days, the summit offers a view of the Atlanta skyline and Stone Mountain - a distant mountain neighbor. 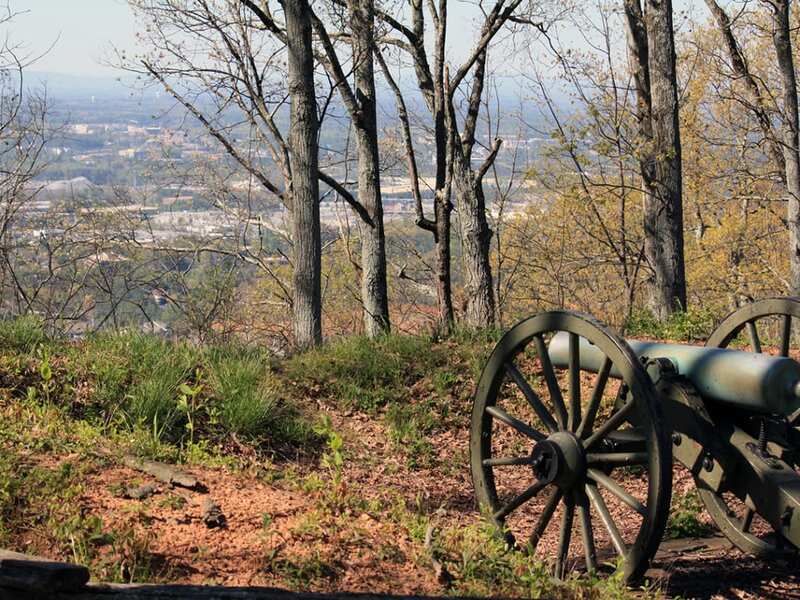 Hike over Kennesaw Mountain, Little Kennesaw Mountain, and Pigeon Hill from the visitor center to Burnt Hickory Road, then take the flat Camp Brumby Trail around the base of the mountain for another five miles. Atlanta’s closest state park, Sweetwater Creek State Park , is about 30 minutes west of the city. 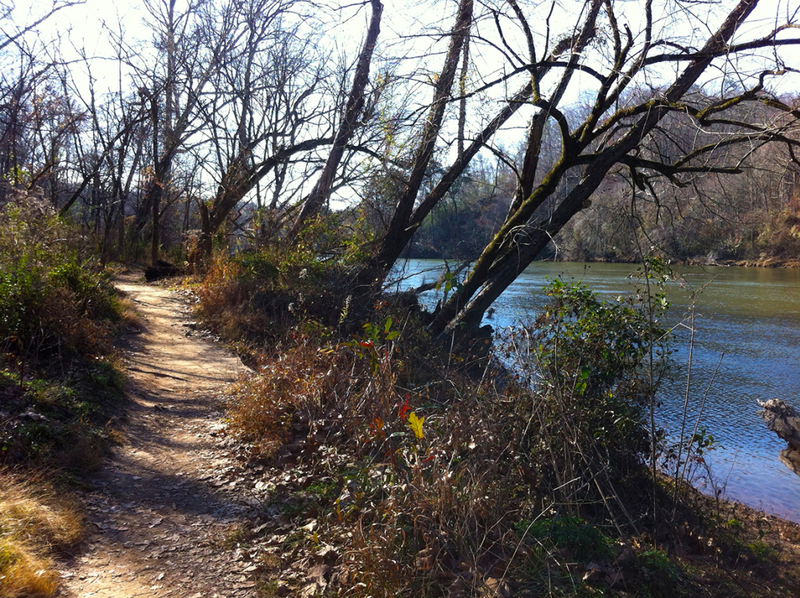 The park is one of the most popular, partly for the short, beginner-level trails that lead to the old Manchester Mill ruins along Sweetwater Creek. The red-blazed trail takes hikers directly to the ruins. For a particularly picturesque hike, take the white-blazed 5.2-mile loop. It crosses fields of wild azaleas and ferns, wanders along the rocky banks of Sweetwater Creek, and descends into forested lake valleys, offering a variety of scenery and terrain. The dining scene in Atlanta is well established. Local restaurants and chefs have won James Beard Awards and recognition in esteemed food publications like Bon Appétit and Food & Wine. The melting pot of culinary talent pays homage to southern cuisine, but international flavors are just as appealing. 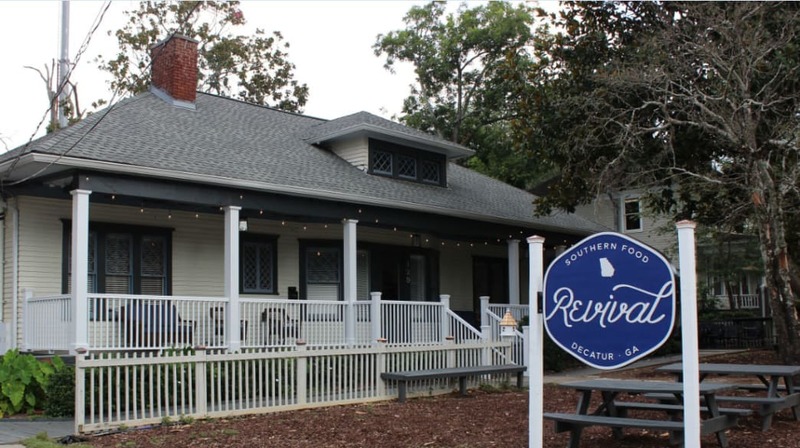 One of Atlanta’s beloved chefs, Kevin Gillespie, recently opened his second restaurant, Revival, in Decatur. The Sunday supper concept, made famous throughout the south, features meatloaf, Carolina catfish, and fried chicken with farm-fresh ingredients. Another iconic dining trend in the south is the cocktail culture and The Mercury focuses on pairing well-crafted cocktails with American cuisine. Dishes are a throwback to America’s beloved steakhouses, featuring certified-prime steaks and chops with hearty sides. Classic Old Fashions and Aviation cocktails take top billing. Bring a group of four to share the large vats of Manhattans and Martinis that are served tableside. The Mercury is one of the newest sit-down restaurants in the Old Fourth Ward’s new Ponce City Market establishment. Cooking up the food and flavors native to the Basque region of Spain is Cooks & Soldiers in the Westside neighborhood. Tables there are highly sought after so weekend reservations can be difficult to secure. If you’re lucky enough to get in, the tapas portions are ideal for a group of friends. Share pintxos (toasted bread with flavorful toppings), or bites of seafood and small plates of octopus, white shrimp and mussels, Chistorra sausage “in a blanket,” or crispy Jamon croquettes. Weekend brunch will forever be popular in the south. One good place to enjoy your mid-morning meal is Bread and Butterfly in Inman Park, as whimsical as any European cafe. The intimate indoor space and al fresco patio are ideal for brunch, where a mix of French-inspired creations include scrambled eggs and smoked trout, potato and raclette gratin, and burgers on brioche buns. Written by RootsRated for RootsRated in partnership with Atlanta CVB.